Penny was kept as a breeder in the Noonbarra Stud and bred us many wonderful pups. 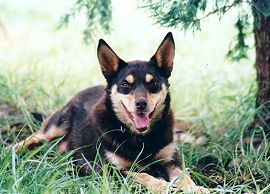 She was sold in 2004 to work cattle in Queensland. The litter to Noonbarra Flash resulted in Noonbarra Meg II that has been kept and is a very good all round versatile worker. She also bred Noonbarra Crom a good young sire that went to Belgium to be the main sire at Patrick Stubbe's new Kelpie Stud. Penny turned into a pretty pup and was very easy to train. She was a good, well behaved dog indoors and picked up toilet training quickly and was obedient. She was a good dog in the house by about 12 weeks. Noonbarra Penny bred us a beautiful litter of four pups in 2002 to Noonbarra Dan IV and we have kept one of her daughters, Noonbarra Debbie in the Stud for future breeding. Noonbarra Kobe and Echo went to two different customers in the USA and Noonbarra Crom went to Patrick Stubbe in Belgium as his future sire. Patrick also bought Noonbarra Betje at the same time and has had Noonbarra Keppe for some years. Penny had her second litter of five pups in 2003 to Noonbarra Flash and we have kept Noonbarra Meg II.